This entry was written by niclewis, posted on Dec 15, 2017 at 2:24 PM, filed under Uncategorized and tagged Climate change, climate models, Climate sensitivity. Bookmark the permalink. Follow any comments here with the RSS feed for this post. Both comments and trackbacks are currently closed. Hey, Nic, good to hear from you. Your posts are always interesting. To be fair, investments are quite different from physical systems. But yes, the central premise is somewhere between sketchy and garbage. “investments are quite different from physical systems.” Very true! But there are also similarities in that both the climate and returns on financial assets are complex, chaotic systems about which making predictions about future events are fiendishly difficult. Climate models and financial e.g., growth, models are similar in that they are both underspecified and mis-specified. They cannot include all the correct variables in the correct forms and some independent variables are either under specified or omitted due to lack of data or inability of modelers. If you include too many variables (overspecification) the prediction algorithm contains redundant predictor variables .. the model may be “correct,” but you have gone overboard by adding predictors that are redundant leading to problems such as inflated standard errors for the regression coefficients” (i.e., overconfidence in the prediction algorithm). As such these should be used with great caution for prediction of a response, and cannot be used to ascribe cause and effect. Feynman would say that we have gone overboard and made the model more complicated and hard to understand than necessary – therefore make it simpler. Thank you again for a clear exposition with a stark conclusion. The first Analysis of Variance I was asked to perform was by hand, before even calculators were easily available. The design was necessarily limited to a few hundred combinations of variables, not the ‘up to 23,976 ‘ you calculated here. It was drummed into me that inspection of all or most of the values of these combinations was an integral part of the procedure, to see if the calculated values contained any that were contrary to expectation, or just looked plain silly. A single wrong data entry can lead to this. If you have a design giving 20,000 combinations, manual inspection needs to be replaced with an automated one. I am not sure that this can be done effectively, particularly to find a wrong entry. It still remains the case that most of the findings from climate science suffer from lack of formal, rigid error analysis. It would be quite a task for a statistician to create and calculate a proper trail of errors as this BC17 exercise progressed through its many successive steps. One is left again with the lurking suspicion that proper, final error bars would be larger by far than the results claimed. Geoff. So they couldn’t see that Fig 1 part c destroys their entire paper! Apparently not fully conversant with statistics, rather a recurring theme with climate scientists. Perhaps they will discover an error in the OLR seasonal data and thus remove this troublesome parameter. A wonderful side benefit of this is that they could then accept Nic’s observation that a single parameter does better than all of them put together, and point out that the OLR climatology parameter (which appears to work about as well as all of them together) leads to a 20% increase in the 2090 temperature! Very nice analysis. The work you put into this is greatly appreciated. The key point is this. Panel c shows that using just the OLR seasonal cycle predictor produces a much more skillful result than using all predictors simultaneously. Nick, doesn’t the presumption that the models are functioning based on physics necessitate an increase in skill with the addition of each independent component predictor? Thanks for your extensive work and sorry if my question reflects a lack of understanding of all of it. Irrespective of how the models function, if the PLS method is achieving its object then one might expect adding additional predictors to improve skill, as long as they were not perfectly correlated, as well as skill increasing with the number of retained PLS components (each of which is a differently-weighted combination of all the predictor variables), up to when overfitting occurs. But I think the problem is probably that overfitting or misfitting (resulting in a suboptimal PLS component) occurs right from the construction of the first PLS component – not really surprising given the huge number of predictors to choose weights for. If prediction error is (wrongly) measured using a single fit for the entire set of CMIP5 models (rather than using cross-validation), then when all nine predictors are used simultaneously the prediction error does decline more rapidly with the number of PLS components used – and is lower except when three PLS components are used – than when just the OLR season cycle predictor is used. In either case, the prediction error reduces to zero when the maximum number of PLS components is used (one less than the number of models), since then there are sufficient degrees of freedom available to exactly fit each CMIP5 model’s predictand. If the PLS method were able to minimize cross-validation based prediction error when forming each PLS component, rather than maximizing cross-covariance, then it probably would achieve a superior result (lower Spread ratio) when using all predictors simultaneously than just any one of them, but such a method would be extremely computationally demanding. Nic, if I understand correctly, you’re saying the basic statistical intention of the paper was not achieved; the PLS method as applied apparently improperly weighted predictors as evidenced by the superior skill of a single predictor, OLR seasonal cycle, over their group of predictors. It seems you are also leaving open the possibility for productive use of their idea if enough computational force is available and it can be done correctly. I read you as giving little weight to the statistical result of the 6% uplift you obtained from using simply the OLR SC. IMO, one cannot cross-validate against an ensemble of unvalidated ideas or models (as Brown et al does) to produce anything of value. I welcome other’s opinions on this. However, testing the models’ component physical functions against the real observed record, especially since the models was last tuned, is I believe a worthy and long overdue enterprise. So for a given model, let’s say the RMS divergence at 2090 between the predicted temperature by the author’s method, and the model’s simulated temperature, is 0.2 C. That is the numerator of the ratio. The denominator is the standard deviation of the all the models ΔTs at 2090. Is that what “of the simulated changes across all the models” means? If the standard deviation of the models temperature change of RCP8.5 at 2090 is 0.75 (est. from fig. TS.15), then the ratio is 0.2/0.75 = 0.27. This obviously isn’t correct. Where is this wrong? Your understanding is basically correct, except that the RMS divergence at 2090 between the predicted temperature by the author’s method and simulated temperatures is the mean across all the models, not for a single model. The standard deviation of the estimated RCP8.5 2090 simulated warming, across the 36 models with data, is 0.60 C, a bit lower than your 0.75 C.
However, your 0.2 C estimate of the RMSE prediction error in their skill estimate is wildly optimistic. Using all predictor fields simulatneously, and the 7 PLS components they use, the actual figure is double that: 0.40 C. So, as they report, the Spread ratio is 2/3. If just the OLR seasonal cycle magnitude field is used, the RMSE prediction error redues to 0.32 C, or a bit lower if only 30S-30N latitidue zone values are used. It is not a very impressive prediction skill in any of these cases. And the Spread ratio is even higher for cases other than RCP8.5 2090. The average prediction error across the other seven scenario – projection date combinations, when using all predictor fields, is 0.9 – a trivial reduction in RMSE error to 0.54 C from the original stadard deviation of 0.6 C.
One of the problems is that the variables used in the paper as predictors tend to be used explicitly for tuning GCMs. As a result, none of the GCMs gets the predictors very far away from observations, save where they have high energy leakages. So a lower difference from observations may largely reflect more attention having been paid to matching observations during the tuning process. It is certainly far from obvious that there will be any consistent link between a GCMs fidelity to observed recent TOA radiative fluxes and the realism of its projected 2090 warming. You can also see the differences between clear and cloudy skies. It also has output for some climate models that are trying to predict weather 1-3 months in the future. So you can see what models do well or poorly at reproducing (given current SSTs, which change slowly). To evaluate the sentence, you need to know what they thought. Nic, Here’s an example that I would like to put forward as a way of thinking about their method. One historical metric we could use to constrain models is aerosol forcing. If we constrain an OAGCM to agree with historical best estimates, according to Mauretsen and Stevens, we would get more warming in the future. That’s because the models with high ECS also have higher aerosol forcing (and too high in the historical period). It seems to me this exercise merely shows that the original model was wrong in more fundamental ways, such as having an ECS that is too high to reproduce historical warming. From a mathematical point of view, this method seems to be uninformative. It merely would adjust the “best tuning” of the modeling group to match more historical measures and indeed might contradict expert judgment and other constraints used to build and tune the model. “Models, all the way down”, is not and will never be a convincing argument, even when it is published in Nature. This forgettable study will be, quite reasonably, forgotten in a few months. Really, the study is symptomatic of what is wrong with climate science. Yes, Steve, the fundamental problem here is that AOGCM’s are simply not skillful at much and tweaking them in this way doesn’t in my view tell us very much. My example illustrates why the paper may in fact show that AOGCM’s are actually flawed. An illusion of science that fools many. Are these models being used as investigative tools? Absolutely not. Their egregious products are upheld as truth. I had already read the paper, but it is good you provided a link. Bjorn Steven’s frustration with the idea you can use the models themselves to prove they are accurate seems clear. Steve, yes indeed. It’s rather difficult to formulate a harsher judgement as Stevend did in a scientific paper IMO. Anyway, the BC 17 -paper seems to reflect such an approach to find models which are more reliable then others. The GHG-Aerosol forcing balance seems to be the key point for any TCR/ECS estimation. Therefore ( beyond some difficulties with their own statistic tools as Nic showed) this paper can’t contribute to narrow the bounds of the sensivity of the real world vs. GHG IMO. It’s missing the point? Frank, That’s for that reference. It’s a good one that I bookmarked for future reference. I would have thought that as evidence of lack of skill and fundamental problems with AOGCM’s accumulates, climate scientists would stop relying on them to predict the future. I suspect its an easy publication to make a bunch of model runs. Fundamental progress is much harder. As I said elsewhere, most of the predictors/observations used by BC17 are not phenomena that are related to dOLR/dTs and dOSR/dTs, the factors determine climate sensitivity. Aerosol forcing is somewhat relevant to dOSR/dTs, because aerosols have increase dOSR during the period of historic warming. High sensitivity models may have been tuned to reproduce historic warming by creating high sensitivity to cooling by aerosols. To the extent that such models don’t agree with observations of aerosols as a predictor, BC17 methodology (assuming I understand it) would underweight that model’s contribution to the high end of the climate sensitivity range. Frank, I think the choice of the OSL/OLR seasonal cycle ( many models are tuned to this measure) is some kind of circular reasoning. The most important issue for high/low ECS ( GHG vs. Aerosol forcing impacts on GMST) is the elephant in the room, not included in BC17. This is a pitty at least. frankclimate: Tsushima and Manabe (2013) shows that various AOGCMs disagree seriously with each other and with CERES about the change the seasonal cycle for: 1) OLR from cloudy skies, 2) OSR from cloudy skies, and 3) OSR from clear skies (seasonal change in surface albedo). CERES and AOGCM agree about OLR from clear skies (WV+LR+Planck feedback = 2.1 W/m2/K). It would be interesting to know if the latter agreement exists because models have been tuned to reproduce this metric. Let me try to understand. The most clever models to predict surface warming for the next century are the models that get the TOA radiation most correct. Some models are clever at hindcasting the TOA radiation for the years 2001 to 2015. These are the same models thet are clever at hindcasting the seasonal OLR radiation for the same years. These are the models we shall trust. So, which models are we talking about, and what values do they show when it comes to hindcasting and forecasting OHC, TOA net SW radiation, TOA net LW radiation and changing lapse rate? “The climate model forecasts, on which the entire Catastrophic Anthropogenic Global Warming meme rests, are structured with no regard to the natural 60+/- year and, more importantly, 1,000 year periodicities that are so obvious in the temperature record. The modelers approach is simply a scientific disaster and lacks even average commonsense. It is exactly like taking the temperature trend from, say, February to July and projecting it ahead linearly for 20 years beyond an inversion point. The models are generally back-tuned for less than 150 years when the relevant time scale is millennial. The radiative forcings shown in Fig. 1 reflect the past assumptions. The IPCC future temperature projections depend in addition on the Representative Concentration Pathways (RCPs) chosen for analysis. The RCPs depend on highly speculative scenarios, principally population and energy source and price forecasts, dreamt up by sundry sources. The cost/benefit analysis of actions taken to limit CO2 levels depends on the discount rate used and allowances made, if any, for the positive future positive economic effects of CO2 production on agriculture and of fossil fuel based energy production. The structural uncertainties inherent in this phase of the temperature projections are clearly so large, especially when added to the uncertainties of the science already discussed, that the outcomes provide no basis for action or even rational discussion by government policymakers. The IPCC range of ECS estimates reflects merely the predilections of the modellers – a classic case of “Weapons of Math Destruction” (6). Harrison and Stainforth 2009 say (7): “Reductionism argues that deterministic approaches to science and positivist views of causation are the appropriate methodologies for exploring complex, multivariate systems where the behavior of a complex system can be deduced from the fundamental reductionist understanding. Rather, large complex systems may be better understood, and perhaps only understood, in terms of observed, emergent behavior. The practical implication is that there exist system behaviors and structures that are not amenable to explanation or prediction by reductionist methodologies. The search for objective constraints with which to reduce the uncertainty in regional predictions has proven elusive. The problem of equifinality ……. that different model structures and different parameter sets of a model can produce similar observed behavior of the system under study – has rarely been addressed.” A new forecasting paradigm is required. Nic: If climate models are going to correctly predict climate sensitivity, then they need to correctly predict dOLR/dTs and dOSR/dTs from both clear and cloudy skies. That is why I have always been fascinated by Tsushima and Manabe (2013) which looks at these parameters GLOBALLY during the seasonal cycle. The global amplitude of the seasonal cycle globally is 3.5 K (which I think is a hemispheric average about 10 K of warming in the NH and -3 K of “warming” in the SH). This drives a global seasonal increase in OLR of about 7.5 W/m2 (or 2.1 W/m2/K). There is less dynamic range in equatorial regions than elsewhere. Since all climate models agree (possibly because of tuning) about the combined WV+LR feedback through clear skies (globally at least), the differences between models arises and between models and observations (globally at least) comes from OLR from cloudy skies. With little humidity and constant CO2 above cloud tops, variation in OLR from cloudy skies may reflection variation in cloud top altitude. I’ve always thought that the next step after TM13 would be to look at how well climate model perform REGIONALLY in terms of seasonal changes dOLR/dT and dOSR/dT from both clear and cloudy skies. However CB17 looks at regional changes OLR, OSR, and radiative imbalance (N), not explicitly how they change with regional temperature (Ts). And he didn’t separate clear and cloudy skies, where the physical mechanisms have different origins. 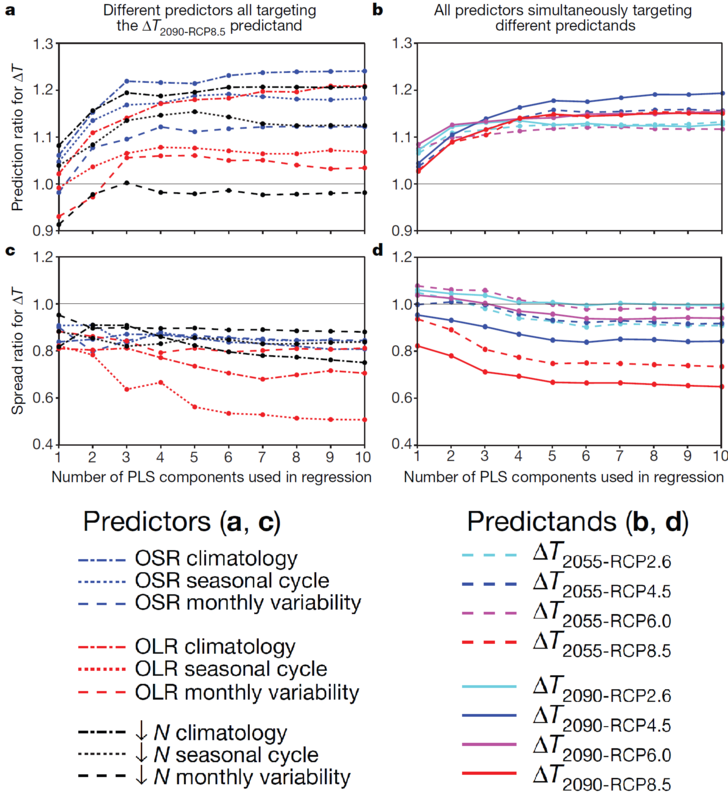 The superior utility of the OLR seasonal cycle in narrowing the spread of climate sensitivity may arise because it is a better measure of dOLR/dTs. Unlike OLR, the seasonal cycle in global OSR is only partially explained by the seasonal cycle in global Ts. Some components of global OSR (reflection from sea ice and seasonal snow cover) lag behind changes in Ts. Both Lindzen and Spenser find better correlations between OSR and Ts about 3 months earlier (in the tropics for Lindzen). Physically, emission of OLR is a function of temperature, but reflection of SWR is not. Reflection of SWR depends on a need for convection to carry 100 W/m2 of (mostly latent) heat away from the surface, which produces parcels of rising cloudy air and descending clear air. This circulation took place during the LGM when GMST was 5 K lower and will still be occurring if GMST rises 5 K.
All AOGCMs presumably are tuned so that the global climatology of OLR and OSR agree with observations. So the global average OLR must be about 240 W/m2 and OSR 102 W/m2. Therefore, this observation/predictor reflects regional DIFFERENCES in temperature (OLR), clouds (OLR and OSR), and surface albedo (OSR). AOGCMs are also tuned to agree with observations of sea ice extent, so this aspect of OSR from clear skies is tuned. Climatological OLR at a particular location obviously varies with “climatological Ts”, but it isn’t a direct measure of how well a model reproduces dOLR/dTs. Assuming constant solar irradiation at the TOA, the radiative imbalance (N) is a function of OLR and OSR. In theory, adding N to the OLR and OSR in this analysis provides redundant information. There is much in what you say. The lack of any direct link between BC17’s predictor variables and measures of dOLR/dT and dOSR/dT is indeed a very major weakness of the study. It is made worse by the variabkes that they use being ones that most if not all models are tuned to match. Your point “The superior utility of the OLR seasonal cycle in narrowing the spread of climate sensitivity may arise because it is a better measure of dOLR/dTs.” is a good one. Well done. And at judithcurry as well. Well done. I wish all climate science could be done in this professional way. Thanks Patrick. Appreciate seeing another perspective presented. Nic: Above I mentioned that BC17 should first analyze their predictors before using them to weight climate sensitivity. IF I understand correctly, predictors are discrepancies between model output and observations. Let’s suppose some models do a better jobs of reproducing OSR (or perhaps seasonal changes in OSR) from areas with marine boundary layer clouds. Other models might have storm tracks in slightly the wrong location, but with little NET change in OSR from this problem. Given the importance of changes in boundary layer clouds to climate sensitivity, it would make more focus on predictors from areas where boundary layer clouds are important. However, one would want a predictor that has not been used to specifically tune the behavior of boundary layer clouds, perhaps seasonal change rather than annual climatology. If models have been tuned to produce the “right amount” of boundary layer clouds, perhaps the ability to simulate an appropriate amount of natural variability in boundary layer clouds would be an important metric. By ignoring the nature of the “predictors” – which I think might also be termed “model errors” (assuming I do understand this methodology), BC17 cleverly avoids characterizing those errors, but asserts that taking them into account narrows the spread of climate sensitivity. I think your analysis has demonstrated the pitfall of applying this method to predictors without a clear connection to climate sensitivity. Frank: you make an excellent point. I agree, the demonstration by Zhao et al (2016) that one could engineer ECS in a GFDL GCM by varying the convective parameteriization without any clear change in how well the model represented any observable aspects of the current climate seems to me a death blow to using such aspects, as BC17 does, as emergent constraints for ECS. My reading of Zhao et al was that the authors were rather worried, and I think surprised, by this finding. Nic and frankclimate: The more I think about Zhao, the more questions I have about I have about asserting a climate sensitivity of 1.8 K, which is perhaps why the paper (nor Isaac) refer to ECS. Zhao was working on the atmosphere-only model (AM4) for the next generation GFDL model(s). It suddenly dawned on me that I didn’t know what kind of ocean (if any) was below that atmosphere and why the term “Cess climate sensitivity” was being used. So I have pasted some of the caveats from the paper about the “Cess approach”. Some of the papers you have discussed suggest that the curvature in Gregory plots (and the changing feedbacks they imply) arise from changes in the ocean. We don’t know what atmosphere (AM4-H, AM4-M, AM4-L, or something totally different) was used in the model(s) GFDL is using for CIMP6 or whether any would exhibit an ECS less than 2 K. We can be sure that whatever atmospheric parameterization was chosen, there are probably equally good choices that could have dramatically different climate sensitivity. This parameterization uncertainty – which isn’t properly explored using the “IPCC’s ensemble of models” – is often ignore. Yes Frank, that’s interesting and should be a big concern for modeling groups and climate scientists who use the results. It’s not a surprise however, since convection is an ill-posed problem. It’s a response to a Nature paper claiming that if aerosol forcings were more negative than thought, ECS could be up to 10C. They used a simple energy balance model. Schmidt found some errors in forcings and ocean heat uptake and redid the calculations and obtained a graph (removed from the Real Climate post perhaps to save disk space). I found it elsewhere and it shows that if total current aerosol forcing was about -1.0 W/m2 then the best ECS estimate was about 1.7C. ECS of 3.0 would require a current aerosol forcing of -1.75 W/m2. 1. This all I believe is corroboration of Nic’s recent energy balance estimates of ECS especially Nic’s statement that uncertainty in aerosol forcing is the biggest uncertainty in this type of calculation. 2. It shows once again how unreliable alarming papers can be, even in Nature. 3. It shows once again that if we use aerosol forcing vs. recent data as a measure of GCM reliability, only the lower ECS models survive. 3 above would also call into question Brown and Caldera and one would have to ask why this obvious measure was not used. It’s a more fundamental critque of the approach of BC17 IMO beyond some technical issues which I’m not familiar with. PS: It’s so sad that the last post of Isaac on his blog is more than 1 year old!